An exhibition, titled Le tombeau de la vaisselle, which means the grave of tableware, is being held from October 13 to November 20 in Shanghai. 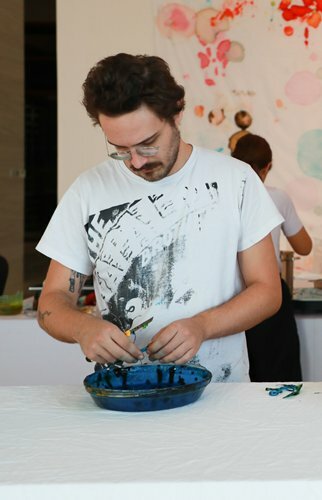 It is a new project that French artist Michel Blazy uses agar with its evolving characteristics to make tableware. This tableware will undergo a quick degradation process and make their appearance change with times. Agar is a comestible jelly made out of seaweed, which can be sculpted into solid, translucent and colorful shapes, according to Blazy. 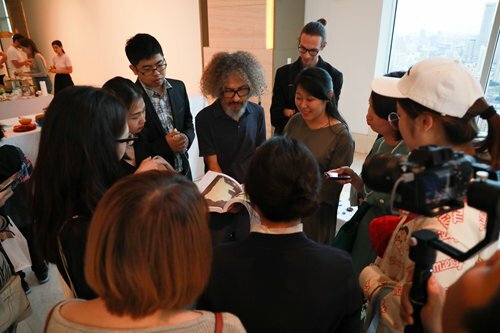 He explained to the Global Times that he was inspired by Chinese potteries to complete the series, which is one of reasons why he chose to hold this exhibition in Shanghai. For this project, Blazy conducts a handicraft workshop of agar tableware two days a week in Shanghai. He provides technical training to three students majoring in different art subjects, giving them basic guidelines regarding skills of making this kind of sculpture while letting them enjoy the freedom to experiment. Jules, one of those students, majors in poetry. He expressed his admiration for Blazy and his concept. He said this experience and related artistic ideas are very likely to inspire him to write poetry. Notably, their joint production will also be presented to the public. Several visitors also shared their opinions with the Global Times at the exhibition hall after observing the process of making agar tableware. Liu, a local resident, visited the exhibition with her eight-year-old daughter. She said it was an original exhibition and she was happy to know the material of experimental sculpture is made up of a comestible jelly so that it is safe enough for children to touch. 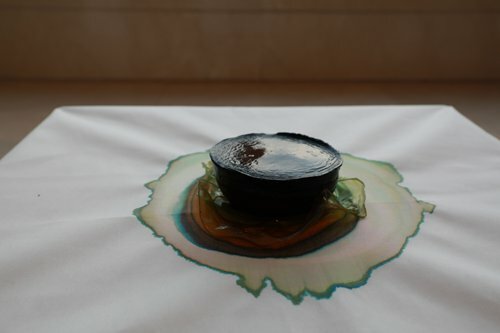 Her daughter also told the Global Times she will imitate Blazy to put colored agar on a white cloth when she goes back home and observe how they change their form with time. 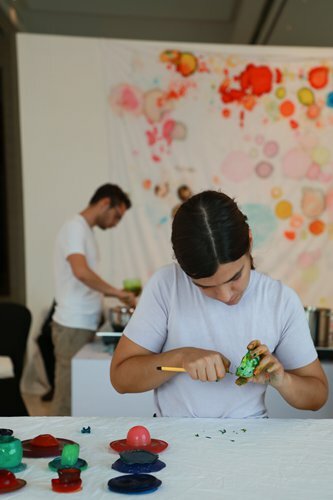 Falaer, Liu's friend, expressed her appreciation of Blazy's concept and agrees that agar tableware transforming during the space and time of the exhibition underline the passing of time even if it is only a plain object. Dai Yue, staff of the Consulate General of France in Shanghai, said white textiles on the wall caught her attention when she went into the exhibition hall. Colorful circles on these textiles reminded her of growth rings in wood, which also represent the process of time passing by. This exhibition is part of the fifth Franco-Chinese Month of the Environment. This festival, running from September 15 to October 14, is themed "drink, eat, breathe." The Embassy of France in China and the Consulate General of France in Shanghai, are the organizers of this festival, according to the Consulate General of France in Shanghai. Over 130 events were held throughout 20 cities in China and France, including exhibitions, dramas, concerts, films, workshops, lectures on literature and technology. During the festival, experts from the environmental field introduced the public to practical solutions about how to reduce air, soil and water pollution. This story was written by Gu Zhiran.